We are delighted to announce that the Co-operators Foundation Community Economic Development (CED) Fund has graciously awarded The Cleaning Solution with a grant worth $20,000! The Co-operators’ fund supports charities, non-profit organizations, and co-operatives that base their work on CED values and principles and whose projects fit with The Co-operators organizational values and strategic priorities. This funding is allocated to community initiatives that assist marginalized individuals and communities, helping them build the capacity for economic self reliance and sustainable livelihoods. The Co-operators CED Funds prioritize projects that lead to job creation and/or enhanced employability for marginalized youth and/or persons with mental health issues. This generous award will be used to further the social mission at The Cleaning Solution. 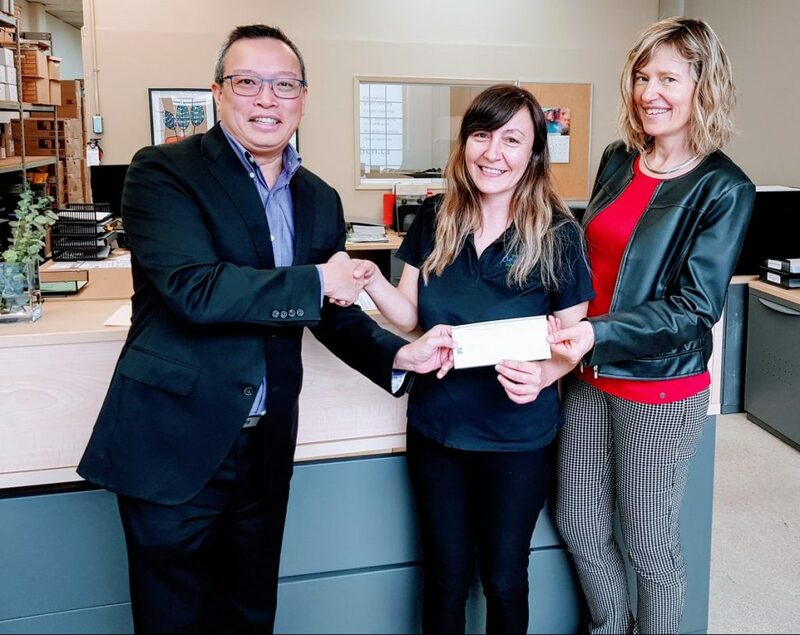 Daniel Wang presenting the Co-operators cheque to Jaclyn Anctil and Marianne Wyne at The Cleaning Solutions office.